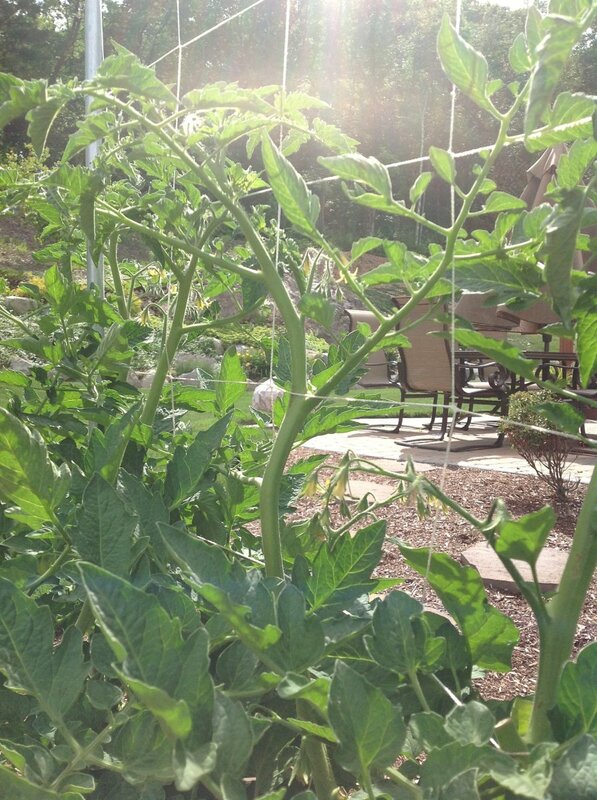 Supporting unwieldy plants in your vegetable garden can be a challenge, especially for tomato plants. There are a myriad of options when it comes to trellises. Your search for a sturdy, inexpensive option is over. 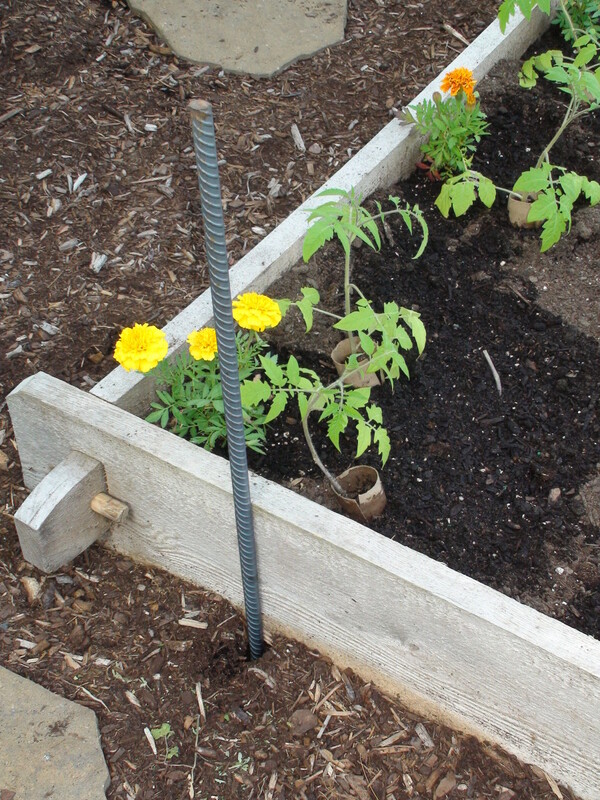 You can make your own tomato trellis using supplies from a home improvement store. Here is a list of supplies and instructions for how to build your own trellis for $20 or less. When plants are healthy, they produce a lot of fruit and get quite tall. 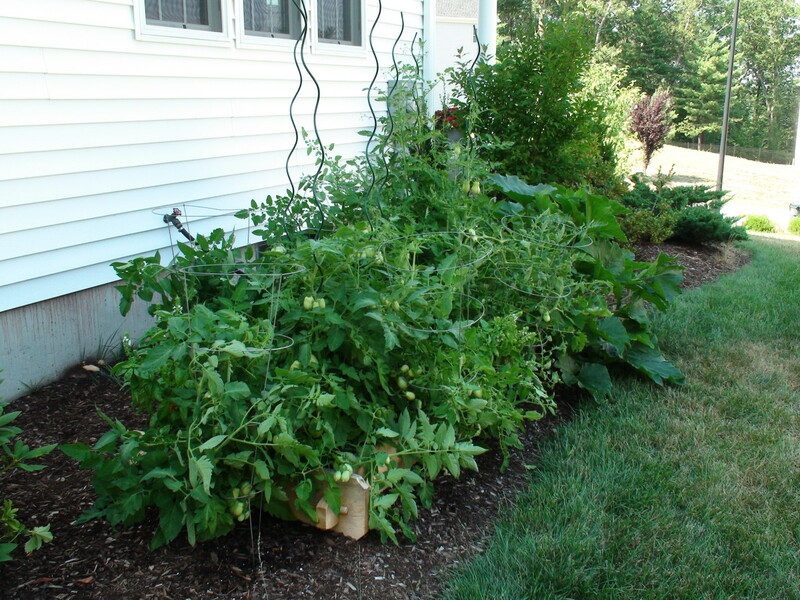 For certain types of tomato plants, tomato cages and spiral plant supports just don't cut it. To give your tomato plants proper support, maximize sun exposure, reduce plant disease and keep fruit off the soil, a tomato trellis is a great option. Of course, depending on the variety of tomato you are trying to grow, it may or may not be a challenge to support the plant. Take the Roma tomato as an example. They grow to be quite bushy. It becomes difficult to support the multiple stems that grow from the one plant. The bush ends up shading itself and other plants, there is less air flow around the plant to help it dry between rains, and the fruit can weigh branches down to the ground. In the end, you have more disease, more insect problems, and if diseased you have less fruit. Depending on your climate, a sturdy trellis might be the only successful way to grow tomatoes. Note: No one method is right for everyone. 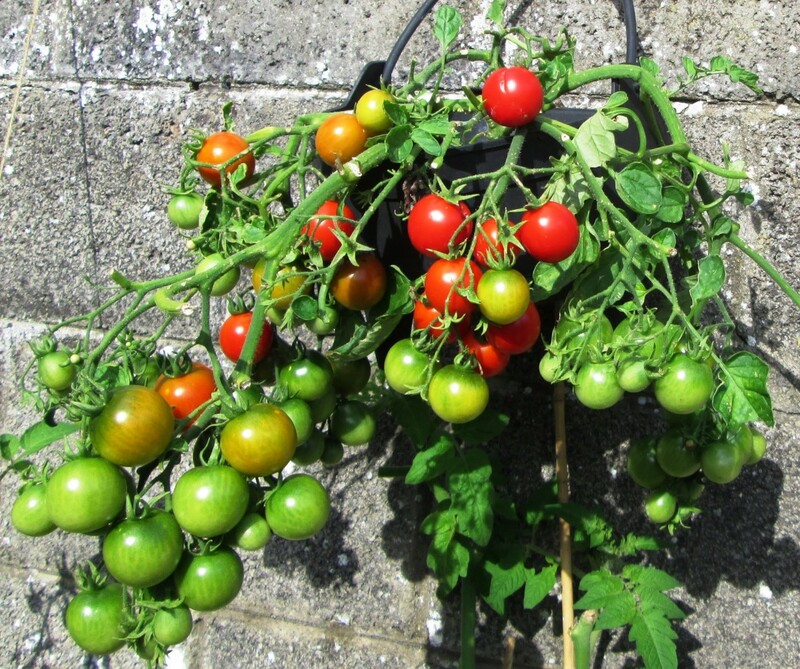 Some prefer to grow tomatoes unsupported and are successful at getting healthy fruit. It may be less frustrating to support the tomatoes in a more organized way. Tomato cages and spiral supports are used in an attempt to support the bushy Roma tomato plants. Plant is more shaded, disease is more likely when the plant stays wet, and fruit gets diseased and eaten by animals or insects when weighed down. Roma tomatoes are an indeterminate variety which means they will continue growing taller and producing new fruit all season, as opposed to determinate varieties that set fruit at one time once the plant has reached it's full height. For Roma tomatoes, one way to manage them is to prune the 'suckers' (or new side shoots) as the plant grows so that the plant's energy goes into one stem, instead of many. That one stem can be wound up the trellis for support. 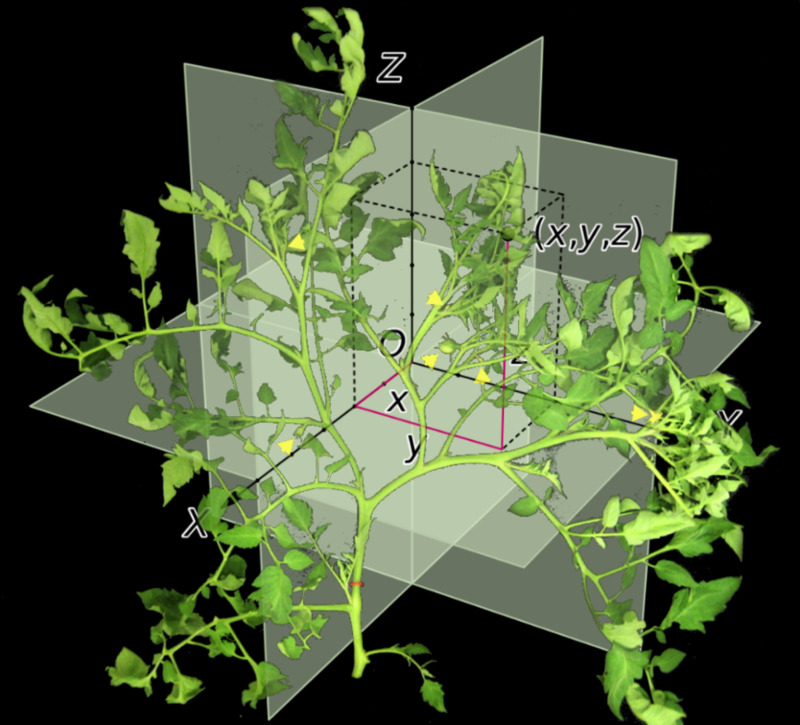 In theory, even though this means less stems producing fruit, that one stem has more energy, growing taller and producing more efficiently with more sun and less disease. Even if it means less fruit per plant, there is now more space to grow, and you can have more plants in the area where one bushy plant would have grown. You might decide to keep more than one stem per plant. If you look at each season of gardening with an experimental outlook, then you will learn what method works best for you and your climate. If you've decided to use the square foot gardening method for tomatoes and are going to build a trellis for support, note that not all varieties will respond equally to being pruned. Within the Roma family, I've had one heirloom variety perform beautifully next to another Roma variety whose growth was stunted. If you've tried letting the plants grow freely and were unhappy with the results, then you may find that using a square foot gardening method with a trellis for support will result in plants that have a better chance at being healthy and producing more fruit. The total cost of supplies listed below is about $20; available at your local home improvement store. 1/2 inch electrical conduit (electrical piping system sometimes referred to as thin-wall or EMT - Electrical Metallic Tubing) - This is an inexpensive and sturdy pipe that is lightly coated to stand up against rusting. 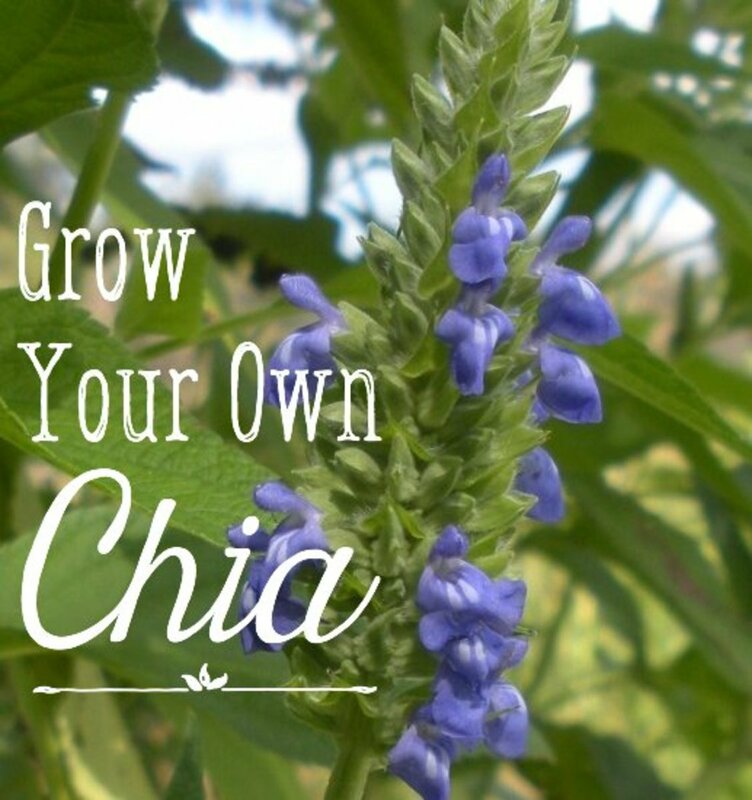 Purchase enough to make the top (length of the garden) and two sides (2 times the desired height). In this case 7 feet top length plus 2 lengths of 6.5 feet for the sides. This is quite tall, but then the option is there to make it shorter if needed. Nylon trellis netting - inexpensive to buy premade for a trellis, usually sold in 5 ft height by various lengths. In this case a 8 ft x 5 ft size. Electrical conduit elbow connector and tied nylon trellis netting. Rebar helps secure the trellis from wind and the weight of fruit and vegetables. 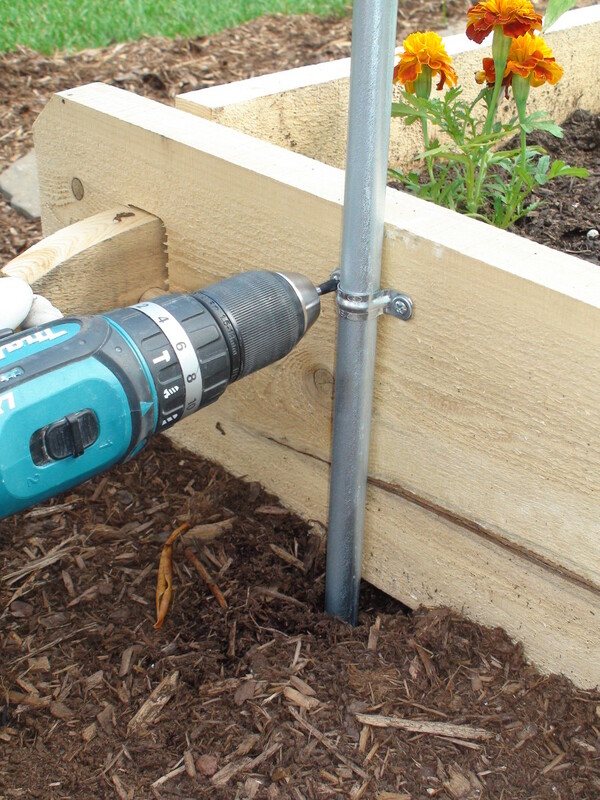 Securing the trellis to a raised bed with a U-bracket helps keep the trellis straight. On the outside edge of the garden, hammer half of the rebar length into the ground. About 18-24 inches should remain above ground. Be mindful of underground utilities. Cut the electrical conduit to desired lengths. In this case, to rise 6 ft above the 6 inches of soil in a raised bed, the side supports should be cut to 6.5 ft. The top length should equal the distance between the two rebar, in this case, just over 7 ft. The pipes can be cut with a dremel fitted with an attachment appropriate for cutting metal. You might find that the home improvement store will cut them for you. Note that if you are using 5 ft high trellis netting there will be about a foot between the top of the soil and bottom of the netting. If you want to begin stringing the plants on the trellis earlier, you will want either shorter pipe lengths or longer trellis netting. Lay the three metal pipes on the ground and connect them with the two elbow brackets, forming the frame for the trellis. Tie the nylon trellis netting to the top of the trellis before lifting it into place over the garden. Have someone help you fit the sides of the trellis over the rebar. Slide the pipes down to be level with the ground. If using a raised bed, secure the pipe to the side of the bed with a U bracket. This will help hold the pipe straight. Tie off the sides of the nylon netting so that the nylon is pulled tight. Cut extra netting off. Although the electrical conduit is coated to protect against rust, the protective layer can wear away over time. Monitor and spot treat for rust as needed. 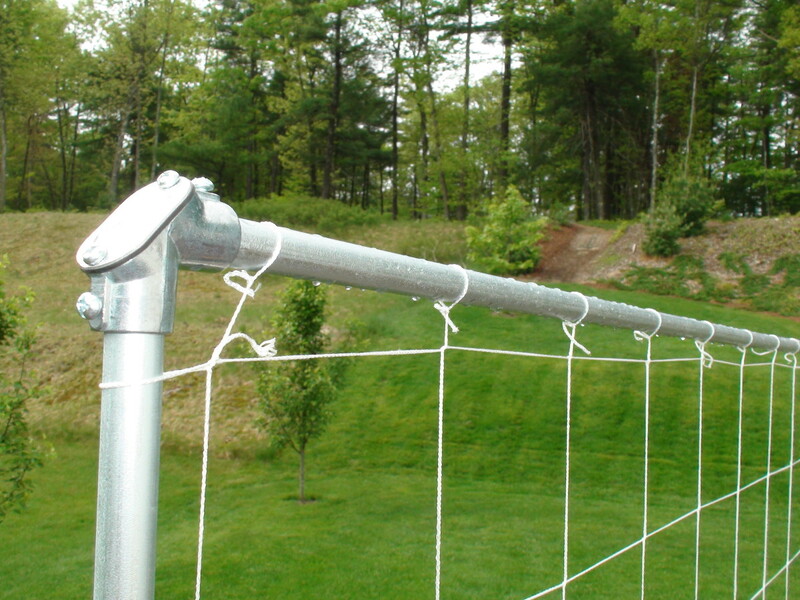 Using a design where the conduits are attached using elbow brackets, the trellis can easily be disassembled and stored in the off season, prolonging the life of the trellis. 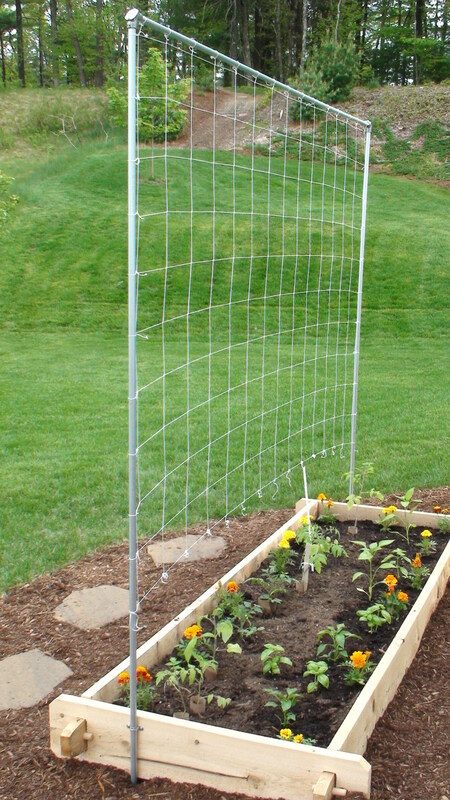 A trellis made of metal piping is both inexpensive and effective for a tomato and vegetable trellis. Use this list of supplies and instructions to build a DIY trellis for your garden. Using square foot gardening in conjunction with a sturdy trellis will help keep the garden neat. A trellis gives plants more sun exposure, more air flow and less contact with soil. These factors can help lower incidence of disease and insects, increasing overall yield. Tomato plants growing up the DIY trellis. This is exactly what I need in my garden! I agree Lizolivia, it really can be a struggle to keep the plants off the ground. The trellis has worked so well I'm building an additional one for another one of the garden beds. Have fun gardening! This is a great idea to trellis vegetables and useful, thanks! I struggle a lot keeping the plants off the ground. Theophilus - If you get a deeper garden bed you will have more wood to use to support the base for a trellis. You could fasten the metal trellis with more U brackets and possibly use a shorter trellis to ensure it is sturdy. Another option is to build the trellis itself out of thicker wood which would be a more sturdy structure not requiring as much base support. I have seen garden bed kits that come this way but they can be quite expensive. Hope this helps. Good luck! What do I do for a trellis when my raised box is sitting on what was formerly a driveway to a garage? I will not be able to drive anything intio the ground. Thanks for your comment gorilla24. It's great learning from each other for the sake of our gardening! Great info indeed, this hub is awesome! Keep up the amazing work, I look forward to improving my gardening skills through your nice hubs! Good to know your experience with the rust and cutting tools. I'm sure in some climates rust can be an issue so it's something to be aware of as a possibility. Thanks for the info! My conduit trellises aren't showing any signs of rust and I've had them for 15 years. I installed nylon netting on them 8 years ago and they're still going strong. You can use a hacksaw to cut the conduit; it's easier than a dremel, in my opinion. AndriyR ~ it's certainly worth a try! It's so much easier to care for the tomato plants when they are trellised like this. Great idea! We use something similar in a warmhouse for supporting cucumbers - with a difference that we make it of wood. Gotta try something like this with tomatoes. Normally we don't support them at all, but I guess if we start doing so - we'll get more crops since the plant won't spend much energy to develop the stalk. Thanks for the link Melis Ann. The A-frame orientation for the trellis make it more sturdy. I'm thinking of growing tomatoes and butternut squash. Sheepsquatch ~ I really like the concept of building the garden up as the season progresses since tomatoes are able to root out along the stem! However, I would be weary of using tires in the garden as they can leach zinc, carcinogenic polycyclic aromatic hydrocarbons and other contaminants into the soil which can potentilly uptake into plants. Hi jpcmc ~ I've also tried bamboo pegs, but you're right, they just aren't sturdy enough over time. This trellis is very sturdy and can be used to support heavy plants. 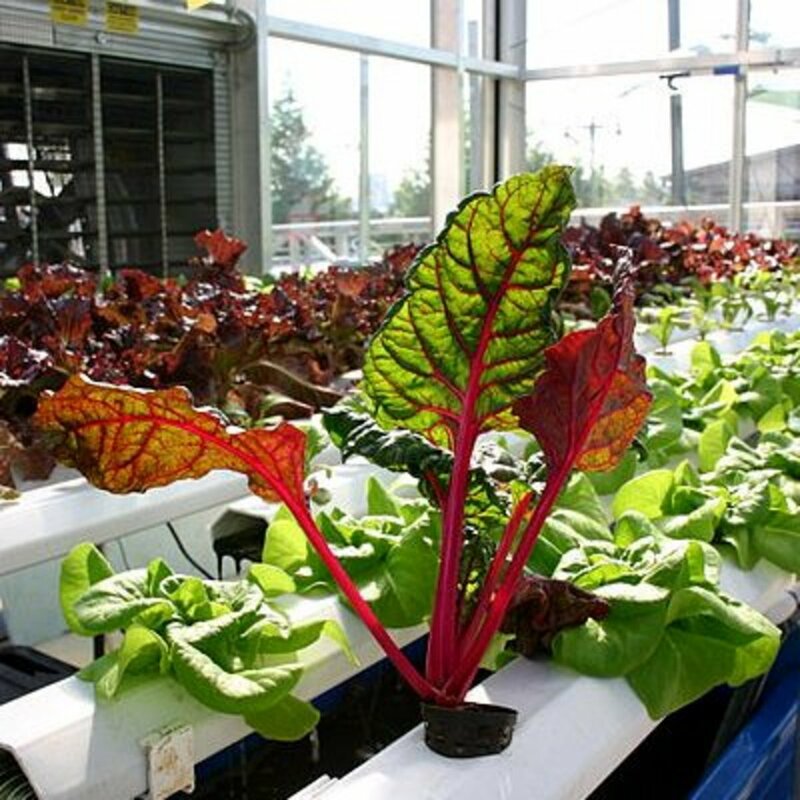 For watering, I'd like to install a drip line to keep the water off the leaves and protect from mildew/mold. This seems like a good way for growing heavy fruit vine plants, very useful. Have you ever seen someone use tires to plant root vegetables. As the plant sprouts you stack more tires on top and feel in with more dirt. It gives several layers of produce in a small space. Awesome hub. I usually use bamboo pegs to support the plant. However, they don't last long. this is definitely a better option. 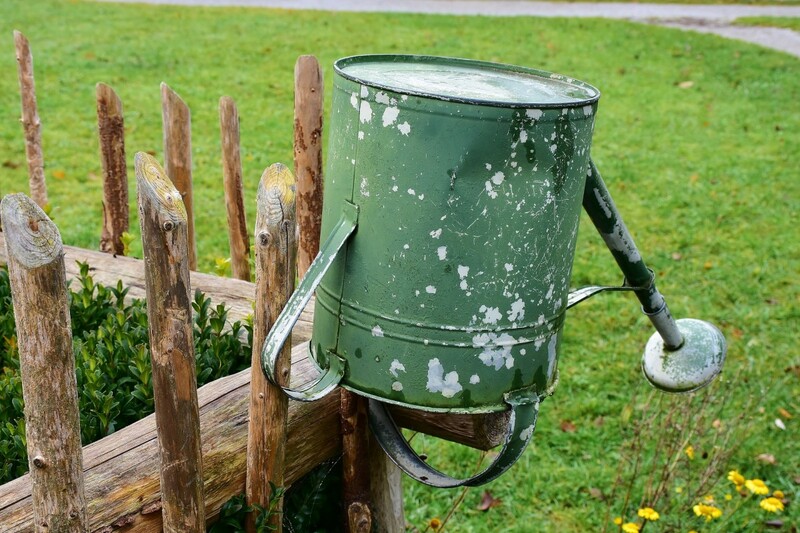 You can even incorporate a watering system into the contraption an make it easier to care for the plants.